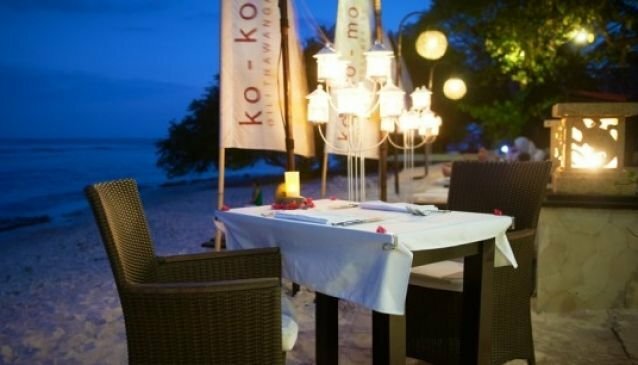 ko-ko-mo's restaurant is renowned on Gili Trawangan as one of the island's top fine dining experiences. The restaurant itself is beachfront creating the perfect dining ambience with the sound of the sea under a canopy of stars. The kitchen is directed by Matthew Blundell, a well known restauranteur and chef from Sydney, Australia, and under his guidance his local team have created a quality menu of delicious choices. Many of the dishes take advantage of the abundance of local seafood on offer: Medallions of Bamboo Lobster, Oysters, Crab Ravioli, Tuna steak. Meat options include Morroccan Lamb and Beef Tenderloin, and together with a good salad selection and deserts such as Fallen Chocolate and Crème Brulee, the menu truly reflects international flavour. A great selection of imported wines and liquers completes the dining experience.